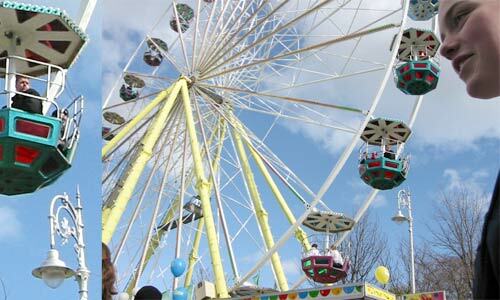 The Big Wheel on Merrion Square. Crew patiently await summer: "You can feel it coming now"
Jody is in another upcoming play this month. This time it's John B. Keane's "The Field." The "Bull" McCabe and his son Tadgh, played by Jody, have worked the field they have rented from Mrs. Butler for the past five years. When Mrs. Butler falls on hard times she decides to sell the field, and the Bull assumes he will get first option. But Mrs. Butler decides to sell by public auction, thus throwing the sale wide open to outsiders, and one such outsider does come with the firm intention of purchasing the field. With the help of his son Tadgh and "The Bird" O'Donnell, the Bull intends to frighten off the outsider, with dire consequences. The play is presented by Martello Productions and runs from Thursday 21st to Saturday 23rd March in St. Benildus College, Upper Kilmacud Road, Stillorgan. The tickets are 7 Euro and can be purchased from Jody if you are in the office. Judging on his performance in his last play I would well recommend seeing this one. Dublin came alive somewhat on Saturday as the sun shone down on a packed Merrion Square with bouncy castles, girls giving away free crap, a stage with quality bands such as Real and Six and bizarrely a man carving a sculpture out of wood using a noisy chainsaw while his friend played the tin whistle. Then in the evening it was time to look at the fireworks. An unusual chain of events led to me climbing out of a window in Mandy's apartment block to see the fireworks. We saw about a quarter of the scene thanks to the new skyscraper in the way. Having managed to avoid Dublin city center and the masses of drunken green people on Paddy's day for the past couple years, I felt that this year was time to pay the penance, I am from Dublin after all. The one thing I was really looking forward to was the fireworks, I'd heard so much about them seen them advertised and was as excited as a child at Christmas time. So I headed down for the Quays, with loads of time to spare, made my way through the crowds of people to find a good spot by the halfpenny bridge. As I heard the first bang I looked up into the sky and was greeted with a sight my eyes could not believe, complete and utter darkness. I strained my eyes towards the custom house and still saw darkness. Along with the other couple of thousand people standing around me I searched the sky for the faintest glimpse of 'The most amazing fireworks display ever seen in Ireland' and finally saw the reflection on the corner of liberty hall. Some clever person decided to move the firework out of sight this year, and thought the best thing would be not to tell anyone about it. It's so typical of any event in Dublin, the build up is huge and they spend so much money on it but it can only be seen by RTE cameras, even though the advice was that the best viewing was along the quays, north and south. All along the north and south quays the children cried and the mothers moaned and the men headed for the jam-packed pub mumbling something about a piss up in a brewery. I felt like a child sitting cross legged by my Christmas tree, surrounded by torn up wrapping paper holding a piece of coal in my fist. Now that wrecks me buzz!